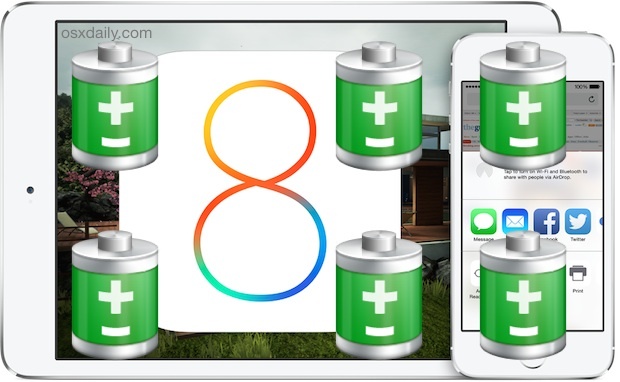 Some users have reported battery draining quicker than usual on their iPhones and iPads that have been updated to iOS 8. While it’s not a universal experience, there are some settings in iOS 8 that may have an impact on how long your battery lasts, thus we’re going to focus on adjusting those settings to preserve the battery life of your iOS devices. Obviously if you use or like any of these specific features, you may not want to disable them, as turning them off would render them inaccessible or nonfunctional. That’s up to you. And remember, one of the best iOS 8 features is the ability to see battery usage on a per application basis, so you should check that screen first before turning off other settings, you may discover that a specific app is causing your battery grief. 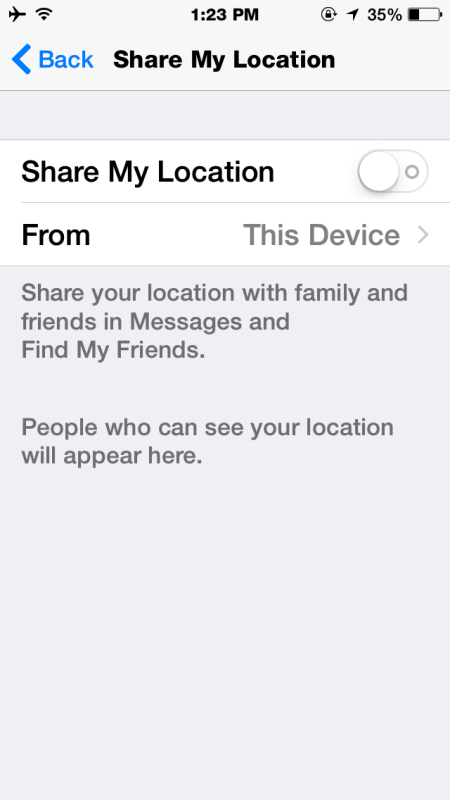 This feature lets you send your location to friends and family through apps like Messages, but as a result, it also can cause Messages to start using location data, which is battery intensive, when it’s not necessary. I’ve accidentally used this one a few times while sending messages, so it’s possible that others have too, which could contribute to battery drain. 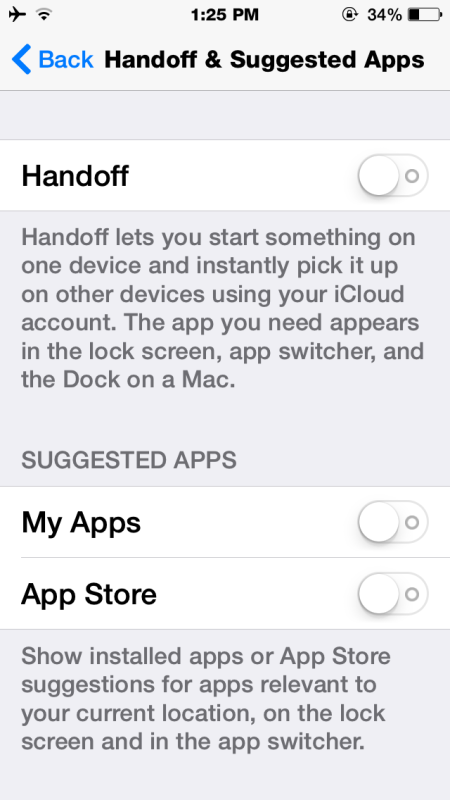 Handoff is an incredibly useful feature of iOS 8, which lets you move an email to another iPhone or iPad (and Mac eventually), or answer an iPhone call on an iPad, or iPod touch, or vice versa. It brings a significant amount of continuity to devices, but it can also cause unnecessary activity on devices where you don’t need it, or where you don’t actually use it. And that’s where the potential for battery issues come into play, because if you have an iPad Air sitting on your desk unused but your iPhone is getting power-called, the iPad Air will be repeatedly waking up to show the call as well. Only disable Handoff if you know you won’t want to use it, because it really is a useful feature that is almost certain to benefit multiple device owners. This is another location-based functionality that recommends App Store apps based on your location. For example, if you go into Starbucks with this feature enabled, the App Store may recommend that you download the Starbucks app. Undeniably useful, but again, it uses location and causes background activity, which may contribute to battery drain. Like everything else in this list, you can always reverse course. 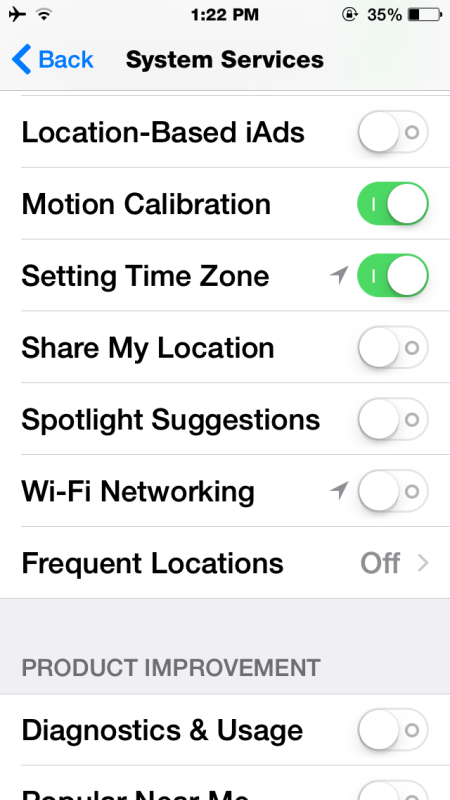 Should you change your mind, just turn this on again to get recommended apps based on your location. iOS has a lot of visual eye candy nowadays with zips, zooms, and floating wallpapers. This stuff looks great, but it uses more processor power to display, and so turning it off can help battery life a bit. Turning off the motion and zooming effects actually ends up enabling a pretty nice looking fading transition to replace them, which also happens to make things some user interface experiences feel a bit faster too. Background App Refresh is just what it sounds like, it allows applications to be updating things in the background even if the apps aren’t in use. That’s great with some apps and if you’re connected to a power source, but if you’re trying to conserve battery it’s working against you. Most users won’t notice any difference in app functionality with this turned off, but it can result in a meaningful improvement to battery life if an app is particularly battery hungry in the background. Automatic downloads can be convenient and allow for remote installation of apps onto your iPhone, iPad, or iPod touch, but they can also drain battery. Consider turning it off. You can selectively adjust this if you want to fit your preferences, but turning off for Apps and Updates can definitely help battery life. Still having battery drain issues? You might want to backup your device and consider reinstalling. This isn’t as hard as it sounds, you reset the iPhone, iPad, or iPod touch to factory settings using an on-device switch (or with iTunes), which basically reinstalls iOS 8, and then restore from your backup during setup. Sometimes simply reinstalling iOS is enough to resolve battery issues for users (and many of the reported iOS 8 wifi problems too), so it’s worth a shot if nothing else is helping. What about your iOS 8 battery experience? 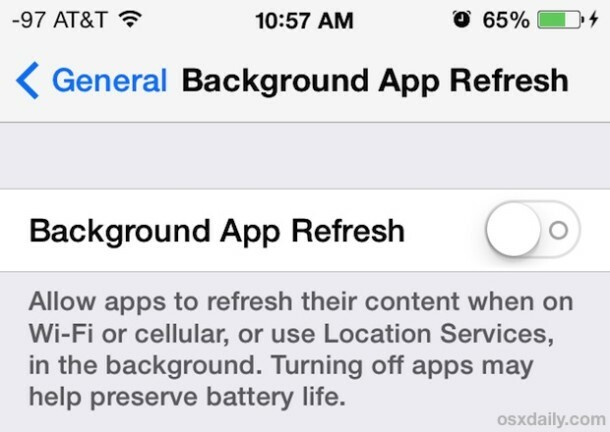 What has your battery life experiences been with iOS 8? Has it improved? Has it declined? I’ve had a mixed experience, with iOS 8 running very well on one iPhone while draining another iPhone 5 quite rapidly until some of the above settings were adjusted. Additionally, on a new iPhone 6 Plus, iOS 8 runs marvelously and the battery life is stellar, so any potential battery draining issues certainly are not impacting everyone. Let us know in the comments what your experience has been! If Paul Horowitz reads this, and would like a suggestion for something to tinker with on an Apple, Bluetooth is finicky. How do you make Bluetooth unforget a device, like a Bluetooth speaker I ticked to forget thinking this would be easy to reset and pair the speaker with? Bluetooth on my iPhone 5 recognizes one speaker but not the other. I’d like to see Terminal tricks for Bluetooth. These look like good tips. Thanks, Paul. You’re very welcome! They helped quite a bit on my iPhone 5 with iOS 8, hopefully others will notice the same improvement. 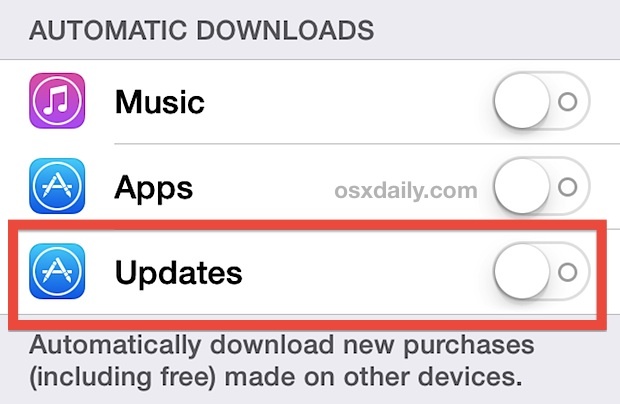 Also, every update, whether major or point releases, usually turns Bluetooth on by default. If you don’t need or want the Bluetooth feature, it’s worth turning it off to prevent it from using battery power by trying to “sniff” out possible Bluetooth-enabled devices with which to pair. I haven’t updated to iOS 8 yet, but I’ve yet to update without my Bluetooth being turned back on. Yes, that’s rather annoying. It’s turned on for iBeacons, so that when you are shopping, the store’s ads + coupons can be sent to you along with other non specific information. It’s a one-way communication, but still dubious. Great tips. I think these will help. Another to consider adding is Settings >General >Accessibility >Increase Contrast > and turn on “Reduce White Point” and “Darken Colors “. Especially the first one as it will cut down some of the blinding whites. Well I can only report better battery life with iOS 8 on a 5s. The other day, had a normal day, a few calls, many text messages, web surfing, map searches and Facebook browse. Went to put the phone on charge before bed, 11pm, had 85% battery. Ive not had a day like that since buy the phone. I always clean install a new iOS to wipe out any possibility of glitches due to redundant data files. Very good idea! SWITCH OFF EVERYTHING …. but ….why is it in then? Yesterday was my first day with iOS 8 on a 5S. I had a fully charged battery at 7:30am, and with zero usage, the battery was down to 73% by 11:30am. I recharged at lunch back up to 92%, and with minimal usage, was back down to about 52% by 5:00pm. Not good. I was noticing some epically horribly battery life, and then noticed that some push-up tracking app I’d downloaded months ago (and had launched again for the first time, wondering if it had any HealthKit tie-ins) had somehow consumed 52% of my battery. Killing the app seemed to do the trick for me. 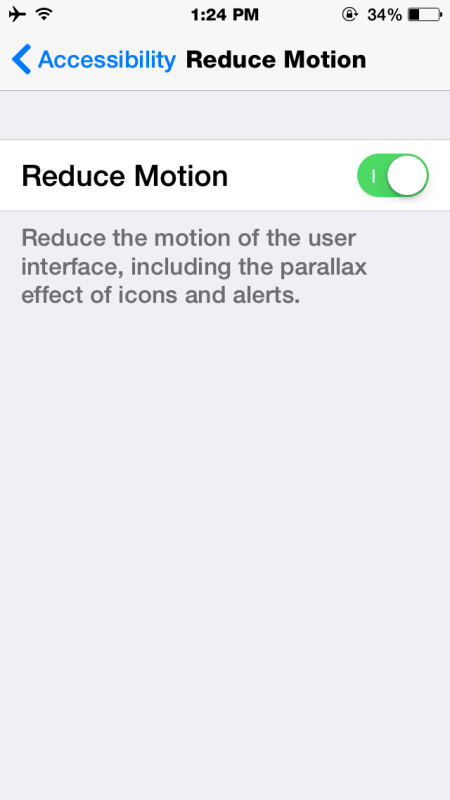 Please do not tell people to reinstall iOs via the settings. As the button says, it will only delete your Content and settings. Please always reinstall via iTunes to repair ios ! Excellent tips, but I’d like to add one that worked for me last year when iOS 7 was killing my 5s battery in 1/8th the usual time. Keep the phone on until the battery goes so low the phone shuts itself down. This seems to cause something to reset in the OS. Wait about ten minutes and recharge to 100%. This brought my phone back to normal. I’m in the process go trying it now since I’m seeing a 30-50% hit on my battery life. I believe that my 5s is getting better battery life with iOS8, time will tell. Great tips. actully awesome dsigned for me. My iphone 5 won’t fully charge overnight after updating to IOS8 . I use an apple charger and have tried every tip I could find on line. Apple ruined my phone. Last night I got 64%. I’ve seen it discharging while plugged in. Bill, there may be dust in your phone’s ac port that prevents it from charging. I suggest cleaning that port with compressed air or something that won’t damage it. Otherwise take your phone to an Apple Genius Bar and have them figure out why the battery is discharging so fast. They may even give you a new phone if your phone is found to be defective. So, let’s see I buy a smartphone and then turn off half of everything to save a little battery. May as well trade it in and downgrade to a slider phone no? Keep it all on people and enjoy your smartphone the way it was designed!